This is post is part of the ‘one threex a day’ challenge. This challenge is to publish every day one game extension for three.js! One per day, every day and that for 2month! In this post, we gonna talk about threex.oimo. threex.oimo is a threex game extension for three.js. It provides a realistic physics easy to include in your own games. So you can take objects in your game and make them fall as if it was the real world! You can code a pool game in a day! You make rocks fall from the sky in a realistic fashion! Sky is the limit! It is a warper over the excelent library oimo.js physics library. lo-th, the author does a lot of crazy things! Be sure to check it out! examples/crates.html [view source] : It shows a slow motion demo of a football hitting a wall of crates. 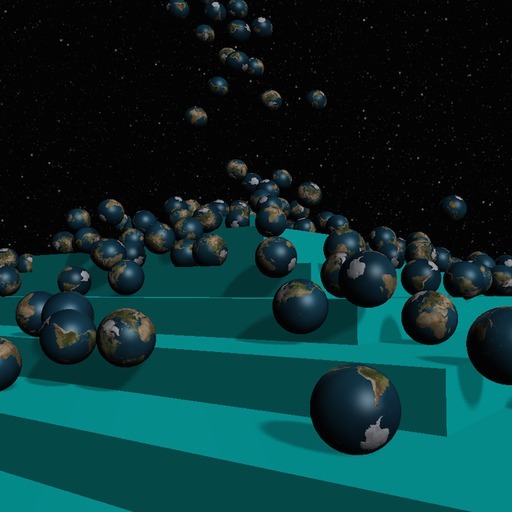 examples/basic.html [view source] : It shows a bunch of cube and sphere falling on a ground. examples/demo.html [view source] : It shows a more elaborate rendering. Planets falling down a pyramid in space. Then, at every frame, update your mesh position/rotation. It will display statistic from oimo.js, it may be useful to know what is going on. It acts very much like mrdoob’s stats or threex.rendererstats. Then, at every frame, update it.